This book presents the sophisticated new features of the most current ANSI/ISO C++ standard as they apply to object-oriented programming. Learn the concepts of object-oriented programming, why they exist, and how to utilize them to create sophisticated and efficient object-oriented applications. This book expects you to be familiar with basic programming concepts. It is no longer enough to understand the syntax and features of the language. You must also be familiar with how these features are put to use. Get up to speed quick on the new concepts of object-oriented design patterns, CRC modeling, and the new Universal Modeling Language (UML), which provides a systematic way to diagram the relationship between classes. 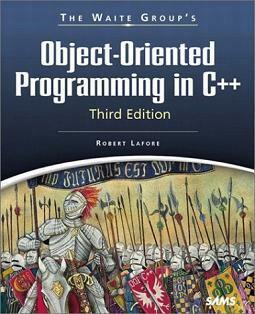 Object-oriented programming is presented through the use of practical task-oriented examples and figures that help conceptualize and illustrate techniques and approaches, and questions and exercises to reinforce learning concepts. Robert Lafore has been writing books about computer programming since 1982. His best- selling titles include Assembly Language Programming for the IBM PC, C Programming Using Turbo C++, C++ Interactive Course, and Data Structures and Algorithms in Java. Mr. Lafore holds degrees in mathematics and electrical engineering, and has been active in programming since the days of the PDP-5, when 4K of main memory was considered luxurious. His interests include hiking, windsurfing, and recreational mathematics.